CBI - China: Day 140 of 154 of the Japanese Invasion of Manchuria. CBI - China: Day 10 of 10 of the Battle of Harbin, Manchuria. Japanese troops enter and occupy the city. CBI - China: Day 8 of 41 of the 1st Battle of Shanghai. CBI - China: Day 35 of 142 of the 1st Battle of Hebei. Spain: Day 203 of 985 of the Spanish Civil War. Germany: Hitler creates a new command for the German army, the OKW (Oberkommando der Wehrmacht) which effectively diminishes his bureaucratic struggles with German military leaders and solidifies his position as Supreme Commander of all German armed forces. From the day Adolf Hitler was appointed Reich Chancellor, he had a problem to overcome. Most of the military leaders in Germany were rational, level headed and sane enough not to go along with his ultimate plans for conquest. Thus, he began a campaign of small nudges to funnel control of all German armed forces under his iron thumb. 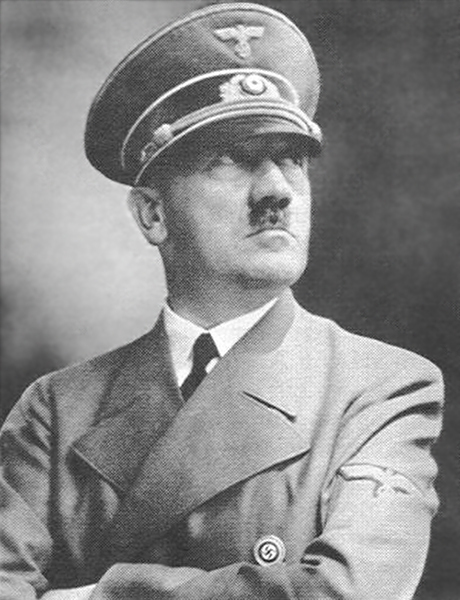 Between the creation of a myriad of organizations such as the Oberkommando der Wehrmacht, setting up different parts of the Nazi bureaucracy to compete for his favor in areas where their administrations overlapped and purging military leaders through fear, intimidation and murder, he eventually was able to consolidate power and authority around his position as Führer to the dismay and detriment of all military leadership throughout Germany. Spain: Day 568 of 985 of the Spanish Civil War. CBI - China: Day 213 of 2,987 of the 2nd Sino-Japanese War. Spain: Day 933 of 985 of the Spanish Civil War. CBI - China: Day 578 of 2,987 of the 2nd Sino-Japanese War. Finland: Day 67 of 105 of the Russo-Finnish War. CBI - China: Day 943 of 2,987 of the 2nd Sino-Japanese War. Day 82 of 381 of the Battle of South Guangxi. Day 8 of 67 of the Battle of Wuyuan. USA: The United Service Organizations (USO) is established to provide social clubs and entertainment for uniformed US military personnel. The USO will become the GI's "home away from home" and will begin a tradition of entertaining the troops that continues to this day. 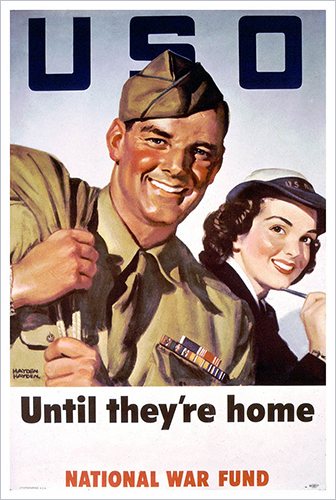 Upon being formed, USO centers were established quickly... in churches, barns, railroad cars, museums, castles, beach clubs, and log cabins. Most centers offered recreational activities, such as holding dances and showing movies, not to mention the well-known free coffee and doughnuts. Although congressionally chartered, it was not a US government agency. Working in partnership with the Department of Defense (DoD), the USO relied heavily on private contributions and on funds, goods and services from various corporate and individual donors. After WWII, in 1947, the USO was disbanded, but was revived in 1950 for the Korean War, after which it also provided peacetime services. Atlantic: German battleships SCHARNHORST and GNEISENAU sail from the Baltic into the Atlantic as part of Operation BERLIN, which will cause absolute havoc to British merchant shipping routes and timetables. From January to March 1941 the SCHARNHORST and GNEISENAU conducted Operation BERLIN against British merchant shipping in the North Atlantic, sinking 22 ships before returning to base. The naval architects of Germany in the early 1930s designed some of the most beautiful as well as deadly warships of the Second World War. Following Germany's rejection of the provisions of the Treaty of Versailles, the Kreigsmarine enacted a building program to enlarge and modernize the German Navy which then was composed of obsolete pre-Dreadnought battleships and a few modern light cruisers and destroyers. The first major units constructed were actually begun by the predecessor to the Kreigsmarine, the Reichsmarine of the Weimar Republic. These were the Deutschland class Armored Ships, sometimes called "Pocket Battleships" and later reclassified as Heavy Cruisers. These ships were designed to replace the old pre-Dreadnought battleships and incorporated electric welds to reduce displacement, diesel engines for extended cruise range to enable them to serve as commerce raiders and a battery of six 11-inch guns. While an advance over anything in the German inventory, they were outclassed by the British battlecruisers HOOD, RENOWN and REPULSE. 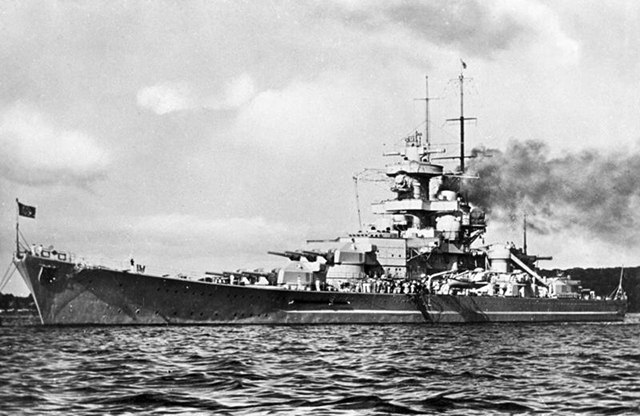 The next and first truly capital ships built by the Kriegsmarine were the SCHARNHORST and GNEISENAU battleships, which in reality were battlecruisers because of their light main battery of 11-inch guns as opposed to the 14-inch, 15-inch or 16-inch batteries of other nations' battleships. 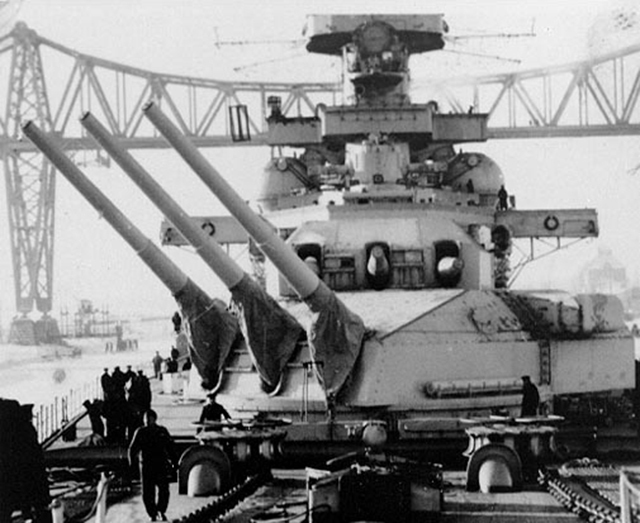 Despite this, the displacement and armor protection of the ships was comparable to other battleships of the era and their designed speed of 31.5 knots was superior to almost all other battleships of the era, including the British King George V Class and the US North Carolina class. Only the British HOOD was their superior in speed. ETO - UK: Day 152 of 258 of the Blitz. MTO - North Africa: Day 58 of 63 of the UK's Operation COMPASS, their campaign in North Africa against the Italians in Egypt and Libya. Italians begin to evacuate Benghazi and head toward El Agheila. The British 7th Armoured Division advances across the desert in effort to cut off the Italian's escape route. East Africa: Day 240 of 537 of Italy's East African campaign in the lands south of Egypt. CBI - China: Day 1,309 of 2,987 of the 2nd Sino-Japanese War. Day 6 of 31 of the Battle of South Henan. CBI - Thailand: Day 127 of 221 of the Franco-Thai War (Vichy France vs Thailand). Atlantic: Day 22 of 169 of Germany's Second "Happy Time," during which U-boats sink 609 Allied ships with little risk. Russian Front - North: Day 150 of 872 of the Siege of Leningrad. Russian Front - North: Day 27 of 29 of the Battle of Toropets, Russia. A failed attempt to break the siege at Leningrad. Russian Front - North: Day 13 of 103 of the Battle of the Kholm Pocket. Another attempt to break the siege at Leningrad. Russian Front - Center: Day 28 of 103 of the Battle of Vyazma, Russia. Russian Front - Center: Day 28 of 103 of the Battle of Sychevsk, Russia. Russian Front - South: Day 98 of 248 of the Siege of Sevastopol, Crimean Peninsula. All German attacks against Sevastopol are stopped for the winter. MTO - Libya: The Afrika Korps recaptures Derna and forms a new front line between Gazala and Bir Hakeim. MTO - Egypt: Hahas Pasha forms a new Egyptian Cabinet, making himself the Military Governor. He dissolves Parliament the next day. CBI - Burma: Day 53 of 164 of Japan's Invasion of Burma. CBI - China: Day 1,674 of 2,987 of the 2nd Sino-Japanese War. Day 43 of 99 of the 3rd Battle of Changsha. CBI - Java: Day 6 of 17 of the Battle of Singapore. The British refuse to surrender at Singapore so the heavy bombardment by the Japanese continues. PTO - Borneo: Day 51 of 107 of the Battle of Borneo. PTO - Dutch East Indies: In the one-day Naval Battle of Makassar Strait in the Bali Sea off the Kangean Islands, the Japanese carrier planes defeat the Allied navies. PTO - New Guinea: Day 13 of 18 of the Battle of Rabaul, New Britain Island. PTO - Philippines: Day 59 of 152 of the 1st Battle of the Philippines. 5th Air Force provides air support. ETO - Germany: US 8th Air Force: B-17s and B-24s bomb at Hamm. The bombers are opposed for the first time by JU-88s and ME-110s. Russian Front - North: Day 515 of 872 of the Siege of Leningrad. Russian Front - North: Day 276 of 658 of the Siege of the Kholm Pocket, USSR lays siege to the Kholm Pocket but the Germans hold out for a about a year and a half. Russian Front - South: Day 55 of 69 of the USSR's Operation LITTLE SATURN. A successful drive into the Northern Caucasus and the Donets Basin pushing the Axis troops out. MTO - Tunisia: Day 80 of 178 of the Battle of Tunisia. RAF and US Air Forces provide Allied air support. CBI - Burma: Day 46 of 104 of the 1st Battle of Arakan. US 10th Air Force provides air support. CBI - China: Day 2,039 of 2,987 of the 2nd Sino-Japanese War. PTO - Alaska: Day 243 of 435 of the Battle of Kiska, Aleutian Islands. US 11th Air Force warplanes attack targets at Kiska, the North Head submarine base, the Salmon Lagoon, and at Amchitka. PTO - Malaya: Day 351 of 357 of the Battle of Timor Island, a long guerrilla war ending in Japanese victory. Allies continue evacuating off the island. PTO - Solomon Islands: Day 182 of 187 of the Battle of Guadalcanal. US 13th Air Force provides air support. ETO - Germany: US 8th Air Force B-17s and B-24s attack industry and railroad yards at Frankfurt and other targets of opportunity. Russian Front - North: Day 641 of 658 of the Siege of the Kholm Pocket. USSR lays siege to the Kholm Pocket but the Germans hold out for a about a year and a half. Russian Front - North: Day 22 of 48 of the Battle toward the Narva River, Estonia. This drive helped lift the Leningrad siege and goes on to liberate Narva. Russian Front - North: Day 3 of 191 of the Battle of the Narva Isthmus, Estonia. Russian Front - North: Day 22 of 33 of the Battle of Luga, Russia. Taking this town west of Leningrad will open the door toward Estonia. Russian Front - South: Day 43 of 113 of the USSR's Dnieper-Carpathian Offensive in southwestern Ukraine. Russian Front - South: Day 6 of 31 of the Battle of Nikopol, Ukraine. Russian Front - South: Day 12 of 25 of the Battle of the Korsun Bulge in Ukraine. The Germans start their offensive to relieve the Korsun pocket. Russian Front - South: Day 9 of 16 of the Battles of Rovno and Lutsk, Ukraine. This Soviet victory will increase the gap in the German line from 70 to 110 miles wide. MTO - Italy: Day 19 of 123 of the Battle of Monte Cassino. RAF and US Air Forces provides air support for the Allied ground troops. MTO - Italy: Day 14 of 136 of the Battle of Anzio. RAF and US Air Forces provides air support for the Allied ground troops. MTO - France: US 15th Air Force B-17s bomb Antheor viaduct and Toulon harbor. CBI - Burma: Day 37 of 99 of the 2nd Battle of Arakan. The Japanese offensive on the front gains strength in order to push the British back. The 10th Air Force provides Allied air support. CBI - China: Day 2,404 of 2,987 of the 2nd Sino-Japanese War. PTO - Marshall Islands: Day 5 of 8 of the Battle of Kwajalein. US 7th Air Force provides air support. PTO - New Guinea: Day 139 of 219 of the Battle of Shaggy Ridge. 5th Air Force provides air support. PTO - New Guinea: Day 136 of 162 of the Battle of the Huon Peninsula. 5th Air Force provides air support. PTO - New Guinea: Day 52 of 597 of the Battle of New Britain. US 13th Air Force provides air support. PTO - Solomon Islands: Day 96 of 295 of the Battle of the Bougainville Islands. US 13th Air Force provides air support. ETO - France: Day 188 of 284 of the Battle of Brittany. ETO - France: Day 143 of 236 of the Siege of Dunkirk. ETO - Germany: Day 139 of 145 of the Battle of Hürtgen Forest. ETO: Day 16 of 66 of the Battle to the Rhine. The US 1st Army takes the first of seven Ruhr dams. Belgium is now reported as completely free of German troops. US 9th Air Force provides air support. Russian Front - Finland: Day 143 of 223 of the Lapland War. Finland and Russia have joined forces to kick the Germans out of Finland's most northern province. Russian Front - Center: Day 113 of 206 of the Battle of the Courland Pocket in Latvia. Russian Front - Center: Day 11 of 75 of the Battle of Königsberg, East Prussia (now Kaliningrad, Russia). Russian Front - Center: Day 9 of 17 of the Battle of Rastenburg, East Prussia. The Soviets capture Landsberg, 80 miles northeast of Berlin. Russian Front - Center: Day 10 of 63 of the Battle of the Heiligenbeil Pocket in East Prussia. Russian Front - Center: Day 4 of 31 of the Battle of Schwedt, Germany. Russian Front - South: Day 99 of 108 of the Battle of Budapest, Hungary. Soviet troops have Budapest under siege. CBI - Burma: Day 17 of 61 of the Battles of Meiktila and Mandalay. The US 10th Air Force provides air support. CBI - Burma: Day 15 of 39 of the Battle of Ramree Island. The US 10th Air Force provides air support. CBI - Burma: Day 1 of 99 of the Battle of Pakokku and Irrawaddy River operations in central Burma. The US 10th Air Force provides air support. CBI - China: Day 2,770 of 2,987 of the 2nd Sino-Japanese War. US 14th Air Force attacks the airfield and Japanese HQ at Yungning and railroad yards at Sinyang. PTO - Japan: US 20th Air Force: For the first time, B-29s bomb the Japanese home island, hitting Kobe and Natsusaka. PTO - Japan: US 7th Air Force bombs at Iwo Jima. PTO - New Guinea: Day 405 of 597 of the Battle of New Britain. PTO - New Guinea: Day 289 of 481 of the Battle of Western New Guinea. PTO - Philippines: Day 108 of 299 of the 2nd Battle of the Philippines, aka the Liberation of the Philippines or the Philippines Campaign. PTO - Philippines: Day 52 of 244 of the Battle of Luzon. 5th Air Force provides air support. PTO - Philippines: Day 5 of 22 of the Battle of the Bataan Peninsula. 5th Air Force provides air support. PTO - Philippines: Day 2 of 29 of the Battle of Manila. For six years Hitler, and his mostly-bloodless Nazi revolution, captured the excitement of the German people with a string of amazing achievements. The world that feared him couldn't help but admire him, too.